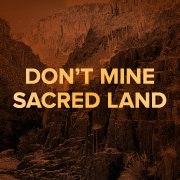 Don’t mine sacred Native American land in Arizona. In what many believe is a first in U.S. history, Congress has decided to give away a sacred Native American site to a massive foreign mining company. (1) We’re joining a last ditch effort to save this land before copper mining begins and this land is irreversibly destroyed. Apache tribal leaders are planning a caravan to Washington, D.C. this month to protest this outrageous land giveaway. We’re joining thousands of activists to help amplify their message and pressure Congress to stop the Apache land grab. Sign the petition: Stop the Apache land grab and protect Native American holy land from copper mining.